If you buy all the matched pieces in a set, the prices are discounted. Three-piece sets are discounted approximately 15%. Two-piece sets are discounted approximately 10%. In the product numbers, the last two numbers indicate the price for all pieces if bought separately, followed by the discounted price. For instance, in the first set below, the price for all three pieces if bought separately would total $64. The discounted price is $55. Please note - Shipping is to the United States only. Changes to the shopping cart mean that I can't add appropriate shipping charges. I would have to charge them either by weight or by price. Neither on is appropriate for this jewelry, because quite a bit of jewelry can be put in one flat-rate shipping box and sent to you for a single shipping charge. So here's how this will work: Shipping charges are included in the price of each item. HOWEVER - if you want to order more than one item, please e-mail a list of the ITEM NUMBERS of your choices to me, and I will adjust the charges for the entire order so that you are charged only ONE shipping charge. 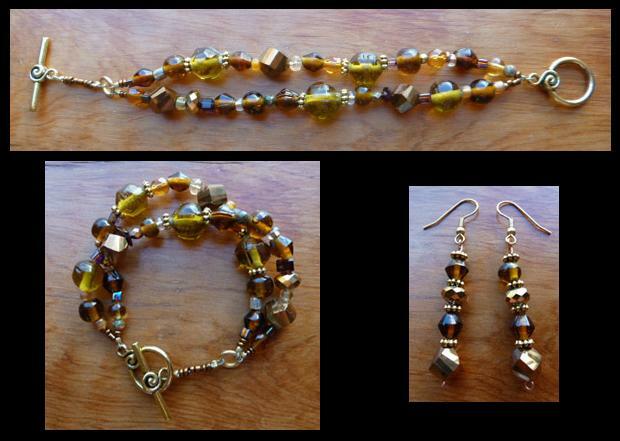 Two piece set of bracelet and earrings. Freshwater pearls, silver plate over stainless steel beads, pewter button clasp, silver plate earwires. $25 plus $5 shipping. Two piece set of freeform bracelet and earrings. Freshwater pearls, moonstone, mother of pearl, opalite and glass beads. Surgical steel earwires. $54 plus $5 shipping. 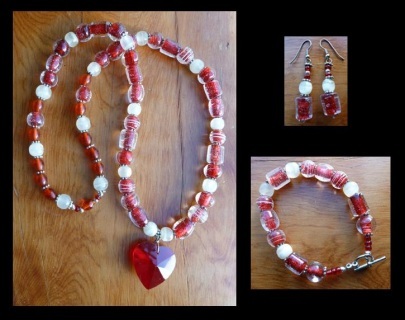 Three-piece set of necklace, bracelet and earrings. 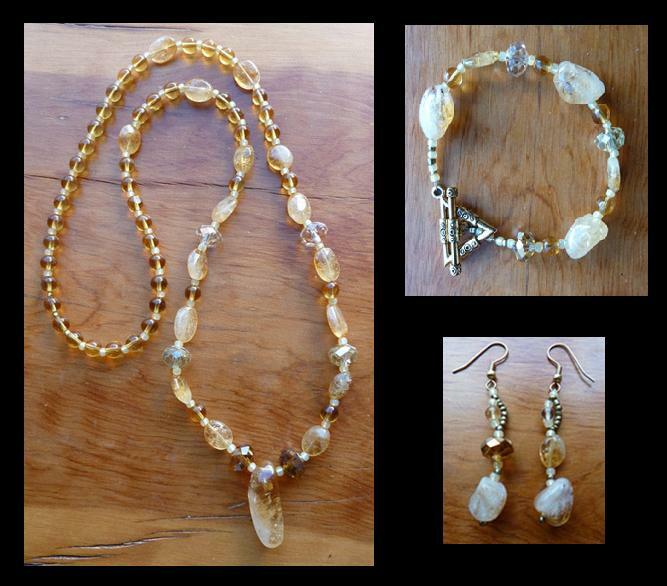 Citrine, glass and crystal beads. Pewter clasp on bracelet. Surgical steel earwires. $55 plus $ 5 shipping. 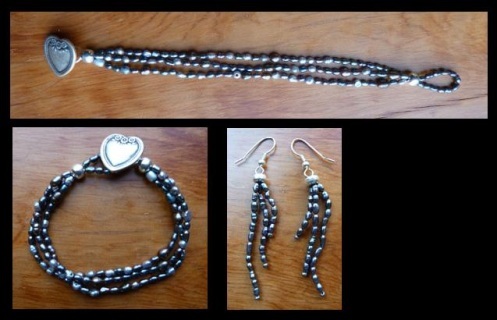 Three piece set of necklace, bracelet and earrings. Glass and onyx beads. Glass crystal heart. Pewter spacers. $55 plus $5 shipping. 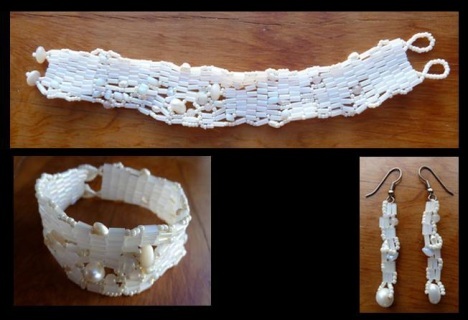 Two piece set of bracelet and earrings. 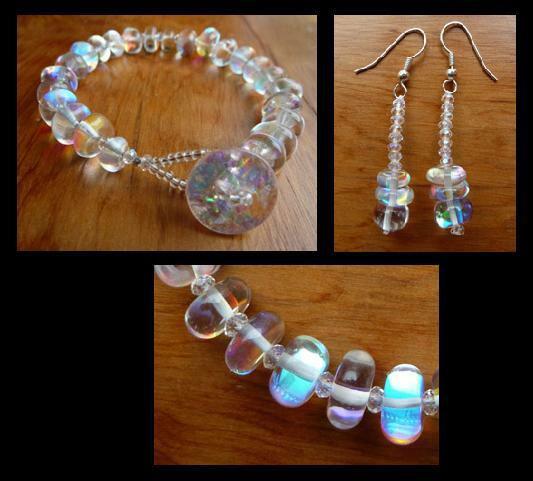 Crystal and rainbow glass beads, pewter clasp. Silver-plated earwires. Two piece set of bracelet and earrings. Rainbow glass beads, glass seed beads and very sparkly plastic button clasp. Silver-plated earwires. $26 plus $5 shipping. 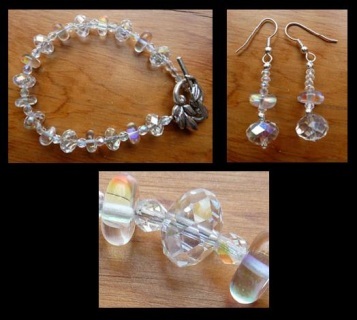 Two piece set of bracelet and earrings. 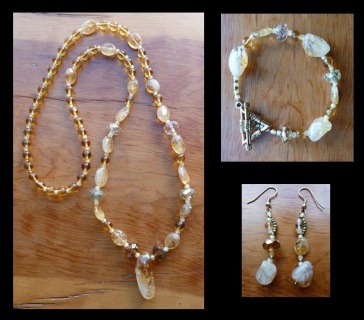 Glass, crystal and stone beads. Gold plated ring and earwires. Gold tone pewter spacers and toggle clasp. $25 plus $5 shipping.